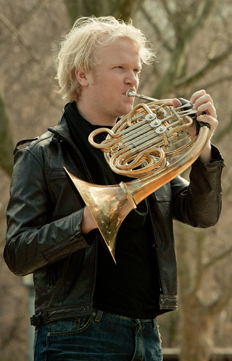 Christoph Eß is regarded as one of the leading horn players of his generation. In addition to his position as solo horn with the Bamberg Symphony, he is a prizewinner of many international competitions and also appears on stage as a sought-after soloist and chamber musician. Starting with the winter semester 2017/2018, he has served as professor of horn at the Lübeck Academy of Music. Christoph Eß completed his studies with Christian Lampert in Basel and Stuttgart and graduated with honors in June 2008. He won prizes at the 2005 ARD International Music Competition in Munich, the 2007 Prague Spring International Music Competition, The Richard Strauss Competition, and the Concorso per Corno di Sannicandro di Bari. He was awarded the solo prize of the Mecklenburg-Vorpommern Musik Festival in 2008, a Scholarship from the German Music Council in 2009, and the prize of the Orpheum Foun dation in Zurich. Christoph Eß has appeared as a soloist with such leading orchestras as the Bavarian Radio Symphony Orchestra, Bamberg Symphony, Tonhalle Orchestra Zurich, Berlin Radio Symphony Orchestra, and the chamber orchestras of Munich, Stuttgart, and Salzburg. Christoph Eß is also deeply committed to chamber music, performing in many different instrumental combinations. His partners include Christian Zacharias, Andreas Scholl, the Fauré Quartet, the Zemlinsky Quartet, Quatour Ebène, Boris Kusnezow, and Viviane Hagner, artists with whom he can regularly be heard at leading music festivals. As the initiator of german hornsound, he has succeeded (with his colleagues Sebastiann Schorr, Stephan Schottstädt, and Timo Steininger) in establishing the unusual horn quartet formation in the chamber concert circuit. With their unusual concert formats, unique creative concepts, and special productions, the four lads now appear at a great diversity of venues throughout Germany and abroad, are attracting attention to their instrument in the media, perform with many orchestras, and can be heard in many chamber music series as well as at music festivals.